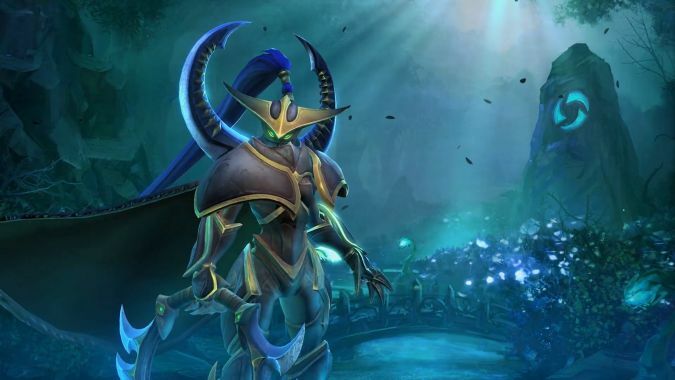 Yesterday, after a couple days of teasing, Blizzard officially revealed Maiev as the next hero coming to Heroes of the Storm. Outside of the reveal itself, however, we didn’t really get any information about the hero. Blizzard made us wait just a liiiiiiittle longer before giving us her Hero Spotlight. But now everything about the Warden is out in the open, and boy does she look terrifying. Fan of Knives (Q) — Maiev throws out several knives in a crescent pattern, hitting all enemies in the targeted area. If she hits at least two enemies heroes, the ability’s cooldown is drastically reduced. Umbral Bind (W) — When activated, Maiev’s next basic attack becomes a large cleave. All enemies hit by this are tethered to Maiev for a few seconds. If a tethered hero strays too far, they are instantly pulled toward Maiev. Spirit of Vengeance (E) — Maiev sends out a shadow version of herself in the target direction, damaging enemies it hits. Upon reaching its destination, the shadow pauses for a second and then moves back to the point at which it was cast. This ability becomes Blink while the shadow is out, allowing Maiev to teleport to its location. Containment Disc (R) — Maiev throws a glaive in the target direction, hitting the first enemy hero in its path. For a short time afterward, Maiev can reactivate this ability to temporarily place the enemy in a time-stop and remove their vision. Warden’s Cage (R) — When activated, a ring of Warden avatars surrounds Maiev. If enemies get too close to an avatar, it pushes them to the center of the ring. Each avatar disappears once it comes in contact with an enemy hero. Vault of the Wardens (Trait) — Maiev vaults into the air, becoming temporarily immune to damage and unable to be hit by area-of-effect attacks. As for how these will all come together? The Spotlight does a good job highlighting the interplay among her kit, but the short version is that she can bait enemies into wasting abilities thanks to her trait, group them up thanks to her tethers, and cleave them down thanks to Fan of Knives’ reduced-cooldown effect. Maiev looks to be the type of hero that will change the meta in a way that either forces players into different heroes if they want to counter her, or outright ban her, leaving an opening for heavily banned heroes like Hanzo and Genji. Similarly, her interplay with someone like Zarya — thanks to Gravity Bomb — or Diablo — thanks to Apocalypse — means enemies will have to be very careful to not get themselves caught too close together. If they do, you can bet Maiev will cleave them down and make them pay. All in all, I’m crazy excited for Maiev. I’m sure she’ll wind up feeling squishier than the Hero Spotlight made her look, but what hero doesn’t? When played right, she looks to be a serious force to be reckoned with, and her kit in general just looks plain fun. What do you think of Heroes of the Storm’s latest addition?